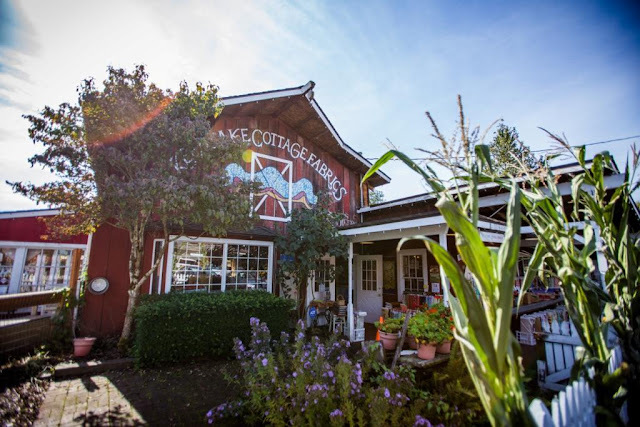 Did you ever go to Country Village in Bothell? From Lake Forest Park you follow Bothell Way to the center of Bothell, turn left, drive a couple of miles and it was on your left. I was enchanted and disoriented the first time I went there. It felt like an amusement park. An eccentric collection of charming little buildings, each with a different business. Way in the back there was a candy shop with fantastic fudge. There were crafters right next to therapy offices. No - not art therapy - at least not that I saw. The layout of the site was random and the colors were as eccentric as the layout and the shapes of the buildings. I don't remember the 16 foot high spotted chicken, but I haven't been there for a long time. But now it's being demolished and a mega housing unit will be built on the site. According to Bothell development services manager Jeff Smith, Pulte (the developer) will remove the pond, restore Little Swamp Creek and build a “promenade” walkway. Tenants were notified a long time ago and most have found new homes - a couple landed in Town Center in Lake Forest Park. Country Village plans to hold a big public auction for some of its iconic items: facades, lamp posts, murals, cabooses and other memorabilia. Crosscut published a long article about Country Village - worth reading, I think. HERE. "Country Village officials did not respond to multiple requests by the Reporter for comment, but a post on the Country Village Shops Facebook page stated that Garden of Beadin’, O’Malley & Potter, Artisan Market, Doll House Baked Goods, Art by Dennis Brown, LuvNailz and Syren’s Voice are still open."